Munich – With 16 goals in 12 appearances in all competitions for FC Bayern München in 2015/16, Robert Lewandowski goes into Tuesday's UEFA Champions League group stage clash with Arsenal FC in the form of his life. In part two of bundesliga.com's exclusive interview with the prolific Poland international, he discusses Bayern's chances of reclaiming the Champions League title, the secrets behind his impressive physique and his role in Pep Guardiola's system. bundesliga.com: Considering the form Bayern are in at present, a lot of people are also looking at you as favourites to win the Champions League? Lewandowski: We didn't have a bad campaign at Europe's top table last season, but then we found ourselves knocked out of the competition. We were coping with a lot of injuries and for me it proved difficult to play in a mask. We weren't in the best shape at the most important moment, and that moment is still to come this season. bundesliga.com: Are Bayern stronger in comparison to last season? Lewandowski: I think so, yes. You could perhaps say we're more balanced and we now know that retaining our level of concentration is essential. bundesliga.com: It is no secret that Pep Guardiola hasn't always been the biggest fan of out-and-out strikers, but it seems to be different with you. Former Bayern striker Giovane Elber has claimed that it's because Guardiola has adapted to your needs and you to his? Lewandowski: That could well be. It's all about the balance of the team. That's the most important point, nothing else. For that reason, it's easy for me to adapt to several different styles of play. I know I have to adapt and play for the good of the team. For me, being a strong striker is not only about being a good goalscorer. bundesliga.com: The crosses and passes from wingers like Douglas Costa and the long balls from Jerome Boateng certainly help too, though? 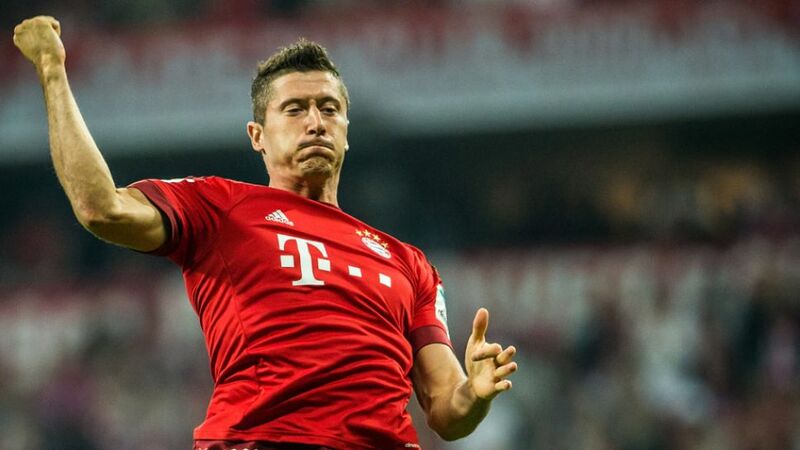 Lewandowski (laughs): The more passes and crosses that you get, the greater the chances of you scoring. bundesliga.com: What was your teammates' reaction like after you scored five goals against VfL Wolfsburg? Lewandowski (laughs): They asked me what was wrong with me! I couldn't explain it. When you score five goals in nine minutes, you've got no time to think about it. At some point I looked up at the big screen to see how long was left in the game and thought to myself, 'Oh, it's 5-1!' I know just one thing, we want to win titles as a team. When we've achieved that, that's when I'll find the time to think back over my personal contribution. bundesliga.com: Your wife, Anna, has also had something to say about the amount of goals you are scoring. We read a quote in which she said it was "boring"? Lewandowski: [laughs] That was just her messing about! She's always delighted for me. Furthermore, she helps me a lot when it comes to my nutrition and recovery. She's a professional dietician. bundesliga.com: Well, now you've got to tell us the secret of the Lewandowski diet? Lewandowski: There's no secret behind it. It's all a question of what I eat and when to make sure I always feel my best. bundesliga.com: It's safe to assume that there are no food sins involved – like sweets, for instance? Lewandowski: You might be surprised to find this out, but sweets were a big problem for me when I was younger. It didn't matter what it was, I couldn't walk past it without buying it. Now I've cut sweets out. It actually took me several years to get to this point. Now I don't really like sweets anymore. bundesliga.com: Your reward is scoring more goals, then. So basically it gets increasingly more dangerous for opponents when you don't want to eat sweets anymore? For Arsenal in the UEFA Champions League as well? Lewandowski: [laughs] It's definitely not going to be straightforward. We want to take three points from the game, but know that it's pretty much Arsenal's last chance to get into the next round of the competition. It's going to be a very tight match and a tough nut for us to crack. But the requirement for us is to win there.